The end of the holidays are drawing heartbreakingly near. Can summer really be over so soon? Is it time to pack away the camping gear, turn on the heating and rediscover the winter coats. No, of course not! We all know that September is often a warm and friendly month, over the last few years September has been markedly better than the summer months. Camping at the beginning and end of the season is particularly good in my opinion. Most of the crowds have passed by, the days are often warm and while it may be a little chillier at night it just gives us an excuse to build a bigger fire. Darkness falls earlier meaning we don’t have to let the kids stay up so late to enjoy the excitement of running around with torches and glowing things. So really, there is no need to be glum about the end of the summer holidays. Just start planning a quick night or two away! Leave work a bit early on Friday, pick the kids up from school and head straight off on a mini adventure so much the better for being snatched at the waning of summer. Yes I feel just like this at the moment, sad that the holidays are drawing to an end but relishing a wonderful Autumn to ease us gently into Winter. Where was the pic taken above? It looks amazing. I do love Autumn, it has always been my favourite month. But, I’m not quite ready for it yet! 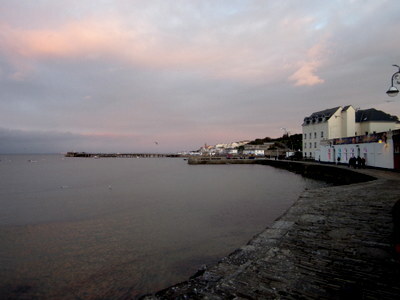 Pic taken in Swanage last year. We were eating fish and chips and watching the sun begin to set. It is a lovely area. We camp a lot in September – it’s a great time of year to go. we had a really memorable weekend a couple of yers ago near Slapton Sands in Devon. Cold at night but lovely lovely days. Hope you get some good trips in this September! Exactly. Are we downhearted by September? No we are not! Lovely post! Thanks, LetterfromBritain! Here’s to September! I remember that crazy October weekend well, we were camping in Brecon in our shorts! Another late surprise like that would be great!